Set out via high-speed hydrofoil for a half-day tour of Peterhof, often called the 'Russian Versailles.' Explore its exquisite grounds―known for their dozens of fountains and hundreds of bronze sculptures―and visit the Lower Park, which boasts a symmetrical layout. 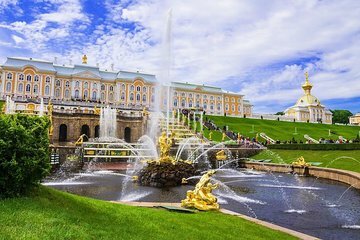 Along the way you'll learn how Peterhof gets its water and have an opportunity to admire the Grand Cascade―Petershof's largest fountain ensemble―from in front of the Grand Palace.